Where do all the vegetables come from? The majority of the country is covered in snow and ice and the temperature are below zero in many places, but the grocery stores have no shortage of produce. Where does all the produce come from? The United States population is 316,148,990. No way all our produce is grown in California during the winter. I assume a lot comes from other countries like Mexico. It was 70 degrees here yesterday and 39 degrees at night. My winter garden is doing excellent. Only time I had a garden equal to this was 1980 when I had a small green house built with double thermo pain glass. It was -17 for 3 weeks and it snowed many times that year, even on an extremely gray over cast day temperature in the green house was 70 degrees. Soil was good and plants grew great. I know there is a 40 acres green house in Chicago, one of my college roommates works there. I wonder how many commercial green houses there are in this country. I bet they grow less than 1% or this countries produce. The grocery store had 3 heads of lettuce for $1 Wed sale special. Wonder where that lettuce came from. When I was growing up in the 50s everyone had a garden in the back yard. Now days some neighborhoods have rules against growing a garden. I think gardeners are few these days. I don't know what I would do if I could not have a garden. Arizona is like living in a 3rd world country and gardening here is a challenge but it is easier in the winter. I have been having a large salad with dinner every day and the tiny garden is keeping up just fine. I have 3 gallons of orange marmalade jelly on the kitchen stove so I need to get off the computer. Re: Where do all the vegetables come from? And what do you do with three gallons of marmalade? I still have bunches of jars of jelly left over, after giving away probably a couple dozen through the Christmas season. With all of this buying and selling and transporting food to and fro -- "The United States is blessed with more arable land than any other nation on earth." US EPA (link) There are more than 400 million acres in crop production in the US. Less acres of cropland are cultivated in China and India, each with about 4 times the population of the US. Despite (or, because of) this abundance of farm production, each dot on this map represents 100,000 tons of topsoil loss in the United State: Erosion Exceeding Soil Loss Tolerance, NRCS USDA (link) That is "loss" as in "loss of cropland value" as well as being "gone" and into our air and waterways. It's an income inequality thing... It's not that the people in places like China, India and even South America would not have a use for their produce. People starve their while their produce is shipped to the US, because we can afford to pay for it and they can't. And even so the market is set up so that we don't pay anything like the real value, including environmental and shipping costs. That is a very interesting if scary map, digitS. 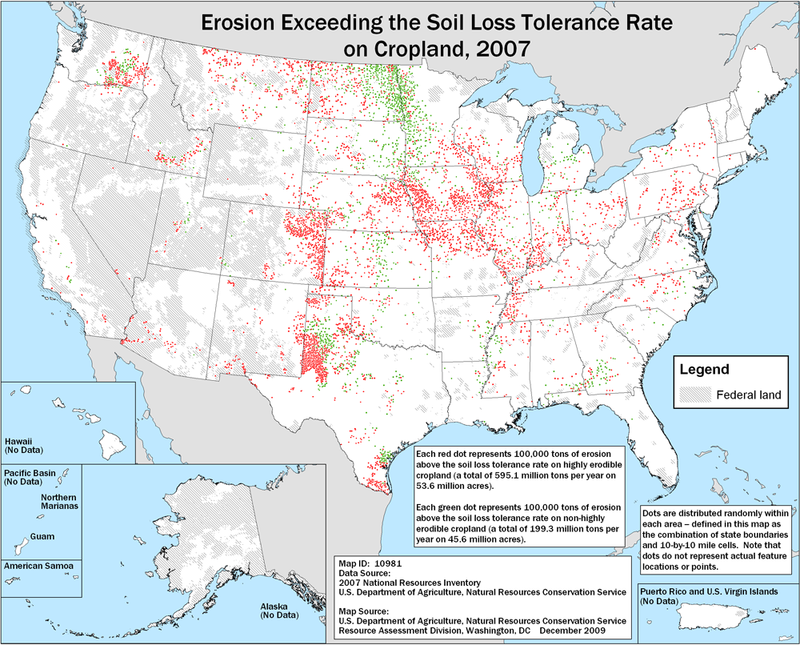 The topsoil loss seems to be concentrated along the Mississippi (flood zone) and through tornado alley and the plains, with a separate concentration in eastern (arid plains) Washington. David Montgomery, Dirt: The Erosion of Civilizations, is very informative on the relationship of agriculture to topsoil loss and the consequences of top soil loss. I heard him talk when he came to town and he gave a terrific presentation. The massive scale of centralization and migration into the cities is interesting to me. Wonder what will be the catalyst that reverses the process. For so many things decentralization is the most efficient, smartest way to produce and deliver goods. We over sixty crowd may not see the day, but I suspect that in the next 50-100 years there will be a massive reversal in the current trend. In fact, I think that we have been seeing many signs that we are in the early stages here in the U.S.
Mass movement toward more rural locations. This is facilitated by remote work opportunities. Everything you say makes perfect sense Alex. In fact it is getting very easy to do a lot of work remotely from home where ever that is; it is getting easier all the time for people to be off the grid with their own solar/ wind systems, etc. It seems that would facilitate movement away from cities. Nonetheless, I just heard a report on NPR yesterday predicting that within the next 30 yrs or so 85% of the population will live in cities. The UN said that urbanisation is now "unstoppable". Anna Tibaijuka, outgoing director of UN-Habitat, said: "Just over half the world now lives in cities but by 2050, over 70% of the world will be urban dwellers. By then, only 14% of people in rich countries will live outside cities, and 33% in poor countries." I couldn't find the specific thing I heard on NPR. I hope you are right, Alex, because your vision seems much more hopeful than 70 -85% of the population crammed in to megalopalises. NYC continues to be just about the hottest place in the U.S., with a housing shortage and with rental rates becoming astronomical. I suspect that some rapidly spreading, lethal diseases will be the catalyst. Living among huge numbers of people in very close quarters will likely become a major factor wrt to natural selection among humans. How long before that special strain of flu or air borne lethal bacteria evolves and spreads much faster than the medical community and other health related agencies can react? An infectious agent just doesn't have to work very hard to quickly spread to all of the major population centers of the world. People are already on the move to the country. I have been looking for some land in the country for retirement for years. A place where I can have a garden, wind mill, solar, and no Home Owners Association to tell me what I can not do in my own yard. Land that I found reasonably priced 10 years ago is either all SOLD or gone out of my price range. I have driven all over the USA looking for a place to live and in some cases prices have gone up from $2000 per acre to $50,000. I still know several places where good farm land can be bought for $4000 per acre but one of my requirements is not to be too far from a modern day hospital, Lowe's, Home Depot, Wal Mart, plenty of reasonable priced restaurants and grocery stores. Those charts about soil erosion came about in the dust bowl days of the 1930s. Now days the same charts show where all the farming is in this country. If you want to buy some low priced land go to farm country. One of these days the High and Might that live in HOA neighborhoods that are only interested in their own self importance's and pay more attention to other people business than to their own business will be starving and may wish they could plant a garden instead of complaining they don't want to hear the neighbors tiller run or see the dust or have to smell garden plants. I made a sudden move away from mold infested Tennessee where it rains 300 days every year in a panic to get well, so I moved to a 3rd world country called Arizona. Life is several times harder hear, prices are higher, and people in the HOA neighborhoods are like living next to the Gestapo. I am well now but I am also paying the price. Weather is nice here 70 degrees all winter, soil and water are both 8.5 ph, nothing will grow if you don't add tons of organic material and fertilizer to the soil. Gardening is a challenge it took me a while to learn what works. It is 95 miles across town and it is like living on the moon. Grocery store food is cheap and no sale tax on food that is 1 of the few good things about AZ. I want to move someplace different. Some day when there is a food shortage, water shortage, or war, people in the big city will be starving to death within a few weeks and they will all be killing each other for a drink of water or any scrap of food they can get. The people in the big city will never have a chance to move to the country they will kill each other first. Oohh! I don't want to think about plagues! I'd rather think about adequate health care and limiting population growth! Educate women and give them some political power. The result, everywhere, is slowed growth to population. Enough of this sensible, humane and proper thing to do and growth is slowed and numbers even begin to fall. Europe and Japan are both losing population. And, what's it take? Two children families to lower - three children to continue growing. The US already has 80% of its population in urban areas. For one thing, people like to be where people like to be . . . Do we really feel that we are deprived of a choice in the US of where we live? I don't think that 80% or 90% of us do. A real threat to croplands is s p r a w l. Let's get over that. We are burning resources going OUT & OUT while IN - is neglected. Rural is a little different but miles of 6 lane roads and strip malls should be an embarrassment. Are we in the veggie garden forum . . ?? I like discussions like this, but it is Gary's thread - he can rein us in if he wants. Gary, I think you take an unnecessarily negative view of what the opportunities are. Are you familiar with landandfarm.com ? It's a searchable db of rural land for sale. You can search by state/location, by type of land, by price etc. I put in search criteria of 5 to 50 acres, $10,000 to $100,000 asking price, no location specified. It came up with 1300 PAGES of listings around the country. Many of them are in the $1000-2000 per acre range, but a fair number are under $500 per acre. "but one of my requirements is not to be too far from a modern day hospital, Lowe's, Home Depot, Wal Mart, plenty of reasonable priced restaurants and grocery stores. " sounds like you want to live in the city The idea of country is you don't have all that big box cr-p around you! Gary, here in S.C. rural land that is 15 to 20 minutes from conveniences of town can still be bought for probably $2500-$3500 per acre. A little more remote and I wouldn't be surprised to find land for under $2000 per acre. There is a ten acre parcel for sales at $3500 per acre, at the end of our road or about 2 miles away. I think the price is a little high, but smaller parcels do go for a premium. We are just under 20 minutes from the hospital and the same from Lowes, Walmart, drug stores, etc. We are also about 50 minutes from Columbia which has most anything that a person could want. This piece of land is great for a well but has access to city water. Has no access to sewer, but septic tanks work very well in this sandy land. Electricity on our 3000 square foot all electric home runs about $150 per month or less. Our tax bill on the home plus 130 acres is under $1000. Finally S.C. is tax friendly for the retired, it doesn't tax social security, the county gives a $50K property tax exemption on those over 65 (we get that in a couple of years), and the state gives each filer a $15K exemption from tax on retirement income. Gary, You could also come down to TN- seems to be pretty reasonably priced land around here- especially if you look at some small town areas. I'm about an hour from Knoxville and where I am there is a decent amount of land and very few homeowner associations. Look in the small towns in the south and you should have alright luck! I do think Homeowners Associations are a feature of newer tract house and condo developments. I live four miles from down town in a 90 year old house and never heard of an HA until people started posting about them here. I just live out in the middle of nowhere- we don't fool with those pesky things. My neighbors have cows and horses and we can plant pretty much as we like. I consider myself lucky . This is an interesting topic, and if need be mod could move it to 'elsewhere'. I live in an urban area, and am part of a (year 'round) farmers market, so some of my comments come from experience. I see people moving back into town, closer to work (less commute) and extra activities. The big move to the 'burbs' has fortunately slowed. A majority of adults work, which means income, and less time for a real garden. I see more of the urban folk adding a few things, say a few herbs, tomatoes, peppers etc. Then there's the urban chickens, bees and other critters! There could be more backyard veggies than we are aware. The seed racks at HDep, Lowes, garden center all IN town are near sold down by mid-summer. Also the tomato, pepper, other veggies, and herbs starts are sold down. An irony for me to say, is the farmers market is not totally efficient, but is a great venue for local farmers and buyers. For example last Saturday we had 3 produce vendors, all live about 20 -30 miles out. There were some greens, brussel sprouts, sweet potatoes (from fall harvest), each vendor bringing in less than a pick-up load. That can hardly be called efficient! Of course there were other vendors with various items including pickles, baked goodies, soap, other crafts, my knit & woven etc. Of course this venue is more efficient when there is more produce, more vendors, more customers etc. As for living off-the-grid, I am hoping more benefits (tax incentives, working with power companies) to encourage more to have at least a couple of solar panels or 'wind machine' on the urban house. This is just a matter of time, and I'll leave it there as it can get political and business ugly. Please Help Identify these vegetables? Thank you.